Listed churches and chapels in England, Wales, Scotland are set to benefit from £680,000 rescue funding from the National Churches Trust, the UK’s church buildings support charity. Some 13 of the churches being helped are on the Historic England 'At Risk Register'. St Botolph, Boston Stump, in Boston, Lincolnshire – Grade I listed and towering over the fens as a landmark to sailors and pilots, which receives a £40,000 National Churches Trust Repair Grant to help fund urgent repairs to the tower roof and clock and to refurbish the kitchen. St James' Church in Burton Lazars, Leicestershire – Grade I listed and containing the grave of the Zborowski family, whose racing cars were the inspiration for Chitty Chitty Bang Bang, which receives a £10,000 National Churches Trust Community Grant to install much-needed toilet, kitchen and meeting room. St Mary de Castro, Leicester – Grade I listed and where King Richard III worshipped, which receives a £30,000 National Churches Trust Repair Grant to help fund urgent repairs to the roof and drains, to replace the floor and to install underfloor heating. 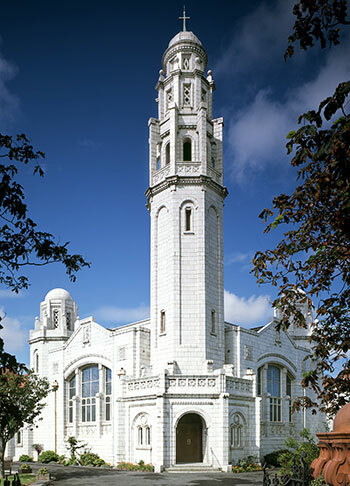 Fairhaven United Reformed Church in Lytham St Annes, Lancashire – known as 'the White Church' (pictured), a magnificent Grade II* listed English Byzantine domed building which receives a £12,000 National Churches Trust Repair Grant to help fund urgent repairs to dry rot damage. Huw Edwards, broadcaster and journalist and Vice President of The National Churches Trust said: “At the heart of communities in cities, towns and villages, churches are a treasure trove of architecture, history and faith. I'm delighted that the future of 93 churches and chapels in England, Scotland and Wales is being safeguarded thanks to grants of £680,000 from the National Churches Trust. What a great Christmas present!" In total 30 Repair and Community Grants have been awarded, providing major funding boosts for vital repair work and the installation of much-needed facilities. Other grants awarded include 15 Maintenance Grants; 8 Project Development Grants; and 36 Partnership Grants.